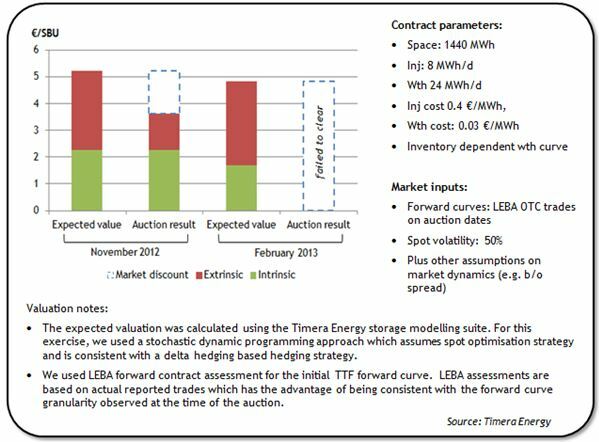 The GasTerra TTF virtual storage auction held in mid February failed to clear above the reserve price level. GasTerra’s capacity auctions provide a useful benchmark for the market value of European gas storage and swing. The auction failure is indicative of the market’s current unwillingness to pay a significant premium above intrinsic value for seasonal storage capacity. The GasTerra TTF virtual storage auction held in mid February failed to clear above the reserve price level. GasTerra’s capacity auctions provide a useful benchmark for the market value of European gas storage and swing. They also provide an insight into the difference between the expected value and market value for capacity. GasTerra’s reserve price level for each auction is confidential, but the auction failure is indicative of the market’s current unwillingness to pay a significant premium above intrinsic value for seasonal storage capacity. GasTerra has held semi-annual auctions for its storage capacity product since 2011. The Feb 13 auction was the fifth auction and the second one which has failed to clear. In order to better understand the value implications of the GasTerra auction results we have undertaken a simple analysis of the last two auction results. The table below compares an estimate of modelled expected value (the value that could be monetised by a capacity buyer) against the clearing price for the Nov 12 and Feb 13 GasTerra virtual storage product for the 2013/14 year . The discount to expected value capacity purchasers will apply to reflect the cost and risk associated with monetising the capacity. We explored the the relationship between market and expected value in a recent article. Although the most recent auction failed to clear, the Nov 12 auction result provides an opportunity to compare expected value against market value. Intrinsic value is a direct function of observable forward market spreads at the time of the auction. As such there is little ambiguity around its measurement and “bankability”. The disconnect between the expected and market value of capacity is the result of different expectations, measurement and risk discounting of extrinsic value. The Nov 12 auction cleared at 3.63 €/SBU. From this an implied extrinsic value premium of 1.4 €/SBU can be backed out. This suggests that the market was prepared to pay around a 60% premium to intrinsic value. This is however only about 45% of our modelled expected extrinsic value (the red bar in the left column of the Nov auction chart). It is not possible to imply extrinsic from the Feb 13 auction given it did not clear. However the capacity value reduction from the Nov 12 auction is clear. This has in part been driven by a further deterioration in seasonal spreads at TTF. It is also consistent with a continuation of subdued price volatility levels as we set out last week. Our modelled expected value has fallen from 5.2 €/SBU in Nov 12 to 4.8 €/SBU in Feb 13. The intrinsic value of capacity has fallen with the decline in seasonal spreads and the percentage contribution of extrinsic value has increased. The relative contribution of extrinsic (vs intrinsic) value may appear high for what is essentially a seasonal storage product. But this comes down to a very low intrinsic value caused by historically low seasonal spreads. As the intrinsic value of capacity declines with a falling seasonal spread, it follows that extrinsic value should increase as a percentage of total value. In other words, the less value that can be locked in against forward spreads, the more important market volatility is as a driver of capacity value. It is important to note that although we show intrinsic and extrinsic value on an expected basis, extrinsic value is much riskier than intrinsic. In other words the distribution of potential extrinsic value outcomes is much wider. Typically capacity buyers will account for this in the way they risk adjust their capacity bids (e.g. using a VaR based risk capital allocation discount). This is a key driver of the discount of market vs expected value of capacity. The level of extrinsic value is also highly sensitive to future expectations of spot volatility. The 50% spot volatility assumption we have used in the above analysis, although very low in an historical context, is above the spot volatility observed over recent months. This average volatility assumption captures both the day to day fluctuations in price as well as more extreme price shocks (fat tail events) that characterise prompt gas prices (e.g. from supply disruptions). The pricing of flexibility contracts, such as gas storage capacity, is inherently linked to the underlying exposures that they are used to manage. In the case of gas storage this is a short exposure to gas price volatility. In a market where recent volatility has been very benign, the value of storage capacity has fallen accordingly. Whether those conditions continue remains to be seen.